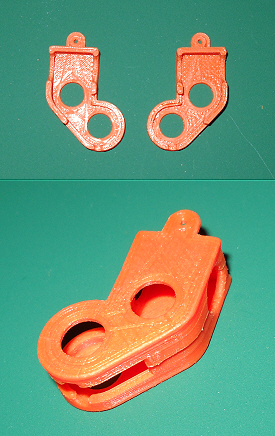 We have now produced a simple 3D printed gear box case for our new 2:1 crossed helical set set shown below. The basic dimesions of the case are Height 19mm, Width 14mm, Depth 9.5mm. The gear box has ball races on both the input and output sides of the box. Following on from the crossed helical gear sets below in this article, we have now produced a set of crossed helical gears with a 2:1 reduction ratio which are also able to be 'Backdriven' if required. This gear set will now form the basis of the next stage in our ongoing gearbox development programme in which we are looking at using 3D printing to produce the gear box case. 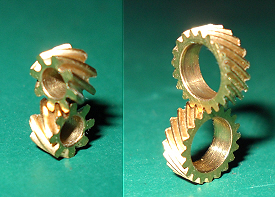 As these gear sets are produced 'In house' other ratios could be produced if required. 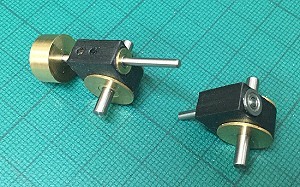 These are two sets of crossed helical gears that we have produced and will be look at using in a new gear box design to allow the gear box to back-drive. These sets are matched for a 1:1 ratio, but we are looking at other ratios in the range of 2, 3 & 4:1. 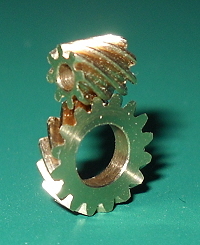 Larger reductions will be done using either helical gears or spur gears and pinions. This is the latest in the ongoing development of our new gearbox designs, using 3D printing to produce the gearbox cases. Using our own in-house 3D printer gives us greater design flexibility and faster turn around times from the initial design concept to finished product. Along with the ability to design and produce our own gears, means that we can create custom gearboxes if required along with any standard gearbox range that we may produce. To read about the rest of our developments so far click on 'Read More' link below. This shows the internal setup of the above gearbox. This is a 50:1 ratio using both a 28:1 right hand worm and wheel gear set and a 50 tooth left hand final drive helical gear. both primary input and intermediate shafts have sealed ball race bearings and the final drive uses aluminium bronze bearings. The final drive axle can range from 2mm to 1/8", as well as our special hexagon drive which is still under development. 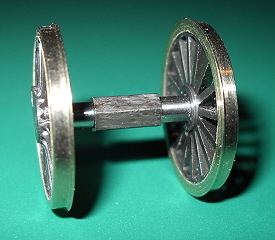 This is version 2 of our new design of gearbox currently under development and is shown without a fly wheel. 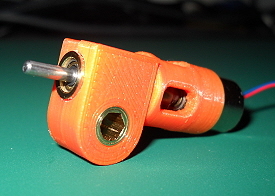 The coreless motor is easily fitted and removed by just sliding it in and out of the motor mount and is connected to the worms' drive shaft by a coupling specially designed to reduce the amount, if not eliminate, the end thrust that is applied to the motor when starting and reversing the gear box. Also, unlike the more traditional etched gear boxes that are available that require soldering to put them together. This one only requires a glue such as 'Plastic weld'. 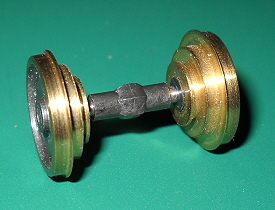 The axle in the gear box shown is secured using a grub screw which is accessed from under the gear box. We are currently working on the next stage of development, which will see the use of ball races for the primary worm input drive and Aluminium Bronze bearings for the output drive. This is version 3 of our gear box which is currently under development, this version now has ball races for the primary drive bearings. 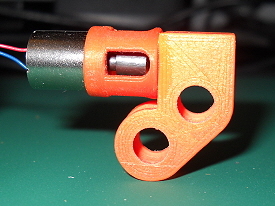 It also has another final drive gear option of a hexagon fixing for the axle. The photos below show two of the possible uses for this drive method. 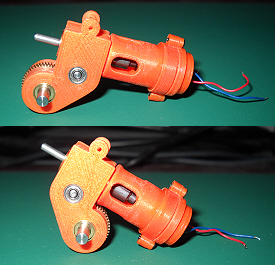 The motor used for development is a 12 volt 10mm x 12mm Coreless Mini Motor available from Nigel Lawton. This option can be used for split chassis pick-up as the nylon hexagon insulates the two sides of the axle. It also allows the axle/gear box to float from side to side without loss of drive. This option has a hexagon ball muff fitted and allows the wheel set to move in more then one plain. This could have uses in a compensated chassis as well as the development of a self contained motor bogie with some basic compensation built in. Hexagonal ball and socket, just some of the parts we have designed and produced to go along with our new gearbox design. Here is one of the latest developments from our Ultimaker 3D Printer, a gear box case for a 2 stage 50:1 gear set. This gear box will have ball race bearings for the primary input worm drive as well as the secondary gear set with Aluminium Bronze bearings for the final drive gear. The motor could be fitted on either end of the gear box depending on whether the final drive gear is to be under the motor or forward of the motor. 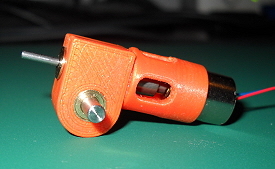 Mock-up of one of the possible configurations for the 50:1 2 stage gear box. We will also be looking at designs of motor mounts so other makes of motor can be fitted. We will also be looking at the possibility of making the gear box so it will back-drive.